(1) The detailed information presented here is from the Soviet and German FILARM model (research) used in Operation Barbarossa: the Complete Organistaional and Statistical Analysis. The so called ‘border battles’ in late June and early July became a series of disasters for the Red Army and VVS. The first disaster occurred on the first day of the invasion when the Luftwaffe hit most of the VVS airfields in the western part of the Western Military Districts. By midnight on 22nd June the Soviet losses had risen to 1 811 aircraft with 1 489 destroyed on the ground. (2) This figure arguably represents the largest single blow ever delivered in a surprise attack against a branch of an armed service in a single day; even surpassing the damage inflicted on the US Navy at Pearl Harbour. After only nine days of war (to 30th June) the Luftwaffe records show VVS losses had risen to at least 4 614 aircraft with 1 438 destroyed in the air and 3 176 on the ground. (3) Luftwaffe losses in the corresponding period amounted to 330 aircraft as total losses. Thus the Luftwaffe had effectively gained air superiority in the first week of the invasion. (2) H. Boog, et al, (German Research Institute for Military history at Potsdam), Germany and the Second World War, Volume IV: The Attack on the Soviet Union. Oxford University Press, New York, 1996. Also, A. Boyd, The Soviet Air Force Since 1918, Macdonald and Jane’s (Publishers) Ltd, London, 1977. (3) H. Boog, et al, (German Research Institute for Military history at Potsdam), Germany and the Second World War, Volume IV: The Attack on the Soviet Union. Oxford University Press, New York, 1996. These figures are Luftwaffe claims, but they appear to be conservative. Even the Soviet’s ‘History of the Great Patriotic War of the Soviet Union’ admits to loosing at least 1 200 aircraft on the first day of war. On 22nd June 1941 the German and Soviet forces were deployed on the border as shown in the map below. Note, the Soviets also had the 27th Army deployed in the rear in the Pskov area. Maps, Copyright; Brian Taylor 2003, Barbarossa to Berlin. On the ground things went almost as bad (for the Soviets) as in the air, with Army Group North (Leeb) making rapid progress across the Baltic States. On 22nd June the 56th Panzer Corps (von Manstein) pierced the Soviet 8th Army’s northern flank and advanced rapidly to the Dubissa River, where it seized a crossing on the Airogola viaduct. 56th Panzer Corps’ immediate objective was to secure a crossing on the Dvina River; hopefully at Daugavpils. Meanwhile further south the 41st Panzer Corps (Reinhardt) attacked through Tilsit towards Rasainiai. Northwestern Front (Kuznetzov) mistakenly identified 41st Panzer Corps’ thrust as the most serious threat and immediately focused its counter-attack mechanised forces in this sector. Kuznetzov ordered the (8th Army’s) 12th Mechanised Corps and large elements of (11th Army’s) 3rd Mechanised Corps to counter-attack the German thrust towards Siauliai. Behind the panzer corps, 18th Army (Kuchler) moved out of its cramped assembly areas and fanned out into Lithuania, advancing along the coast towards Libau. 16th Army (Busch) supported the German advance towards Daugavpils through Kaunas, and pushed towards the Nieman River. From 23rd June, the 41st Panzer Corps’ 1st and 6th Panzer Divisions (with 429 tanks) fought a series of running tank battles with 12th Mechanised Corps and the 2nd Tank Division, dispatched from the 3rd Mechanised Corps further south (4 divisions with 987 tanks, including 52 T-34 and 52 KV tanks). The latter represented the bulk of the armoured reserve of the Baltic Special Military District (Northwestern Front from 22nd June) and included 52 T-34 and 52 KV tanks. As far as is known this represented the first major engagement with KV heavy tanks and there performance certainly impressed the Germans. Despite the numerical and technical imbalance between the forces, the 2nd Tank Division was annihilated in the fighting while the 12th Mechanised Corps withdrew with only around 50 operational tanks left. By 29th June the 41st Panzer Corps had advanced through Rasainiai and established a bridgehead across the Dvina River at Jekabpils. While 41st Panzer Corps drew off the bulk of Northwestern Front’s armoured and mechanised forces, 56th Panzer Corps advanced towards Daugavpils which they reached on 25-26th June. In a coup de main the 8th Panzer Division (56th Panzer Corps) seized the vital road bridge across the Dvina River at Daugavpils and rapidly established a bridgehead. The bridge at Daugavpils is also well known because it became a prime target for VVS bombers attempting to disrupt the 4th Panzer Group’s advance. Many bombers were lost in daylight raids attempting to attack this target which the Germans naturally defended with heavy Flak and fighter cover. 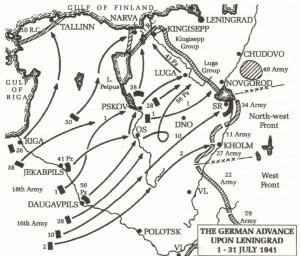 The Soviets naturally attempted to dislodge the Germans from their bridgehead and conducted a series of counter-attacks by committing 27th Army, but to no avail. Included in this effort was the 21st Mechanised Corps (with only 98 BT tanks) brought up from Stavka reserves and used to reinforce 27th Army. With the Dvina River line well and truly breached, Kuznetzov was pointlessly dismissed and replaced by General Sobennikov (the 8th Army’s commander). By 2nd July the 4th Panzer Group (Hoepner) completed its regrouping on the Dvina and attacked towards Ostrov, which fell to 41st Panzer Corps on 4th-5th July. The panzer corps then struck north eastwards towards Pskov, which was heavily defended by the 1st Mechanised Corps from the Leningrad Military District (Northern Front from 24th June 1941) and 41st Rifle Corps (4 rifle divisions). Unfortunately the 1st Mechanised Corps was without its 1st Tank Division (in the far north near the Arctic Circle), and its 163rd Mechanised Division was heavily damaged while counter-attacking the bridgehead at Daugavpils. However the remaining 3rd Tank Division was still near full strength in tanks. On 8th July the 41st Panzer Corps entered Pskov and in a remarkable performance (backed by the German 1st Infantry Corps) the Germans managed to capture the city within a few days. Meanwhile 56th Panzer Corps had advanced from through Ostrov and was planning a deep flanking attack towards Novgorod and Lake Ilmen (see below). 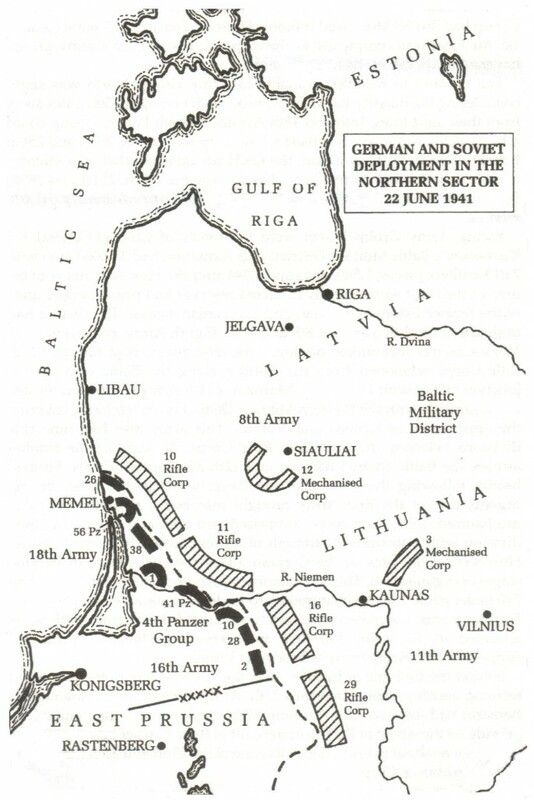 While all this was going on, Army Group North’s 18th Army had captured Riga on 1st July and had occupied Lithuania, Latvia and most of Estonia by late July. By 27th July Tallinn was invested by 18th Army and some 23 000 Red Army soldiers (3 divisions) were still in the city. The Baltic Red Banner Fleet was still in control of the Gulf of Finland and was able to supply and reinforce the Tallinn force to a limited degree. By 5th August 18th Army was besieging Tallinn (with 3 divisions) and was approaching Narva between the Gulf of Finland and Lake Peipus. The Stavka reacted with alarm at Army Group North’s rapid progress and ordered an immediate counter-attack by a reinforced Northwestern Front. This major attack (known as the Sol’tsy-Dno Offensive Operation) was mounted by 7 rifle divisions, and the 10th Mechanised Corps (dispatched from the Northern Front). It commenced on 14th July and struck 4th Panzer Group’s 56th Panzer Corps (Manstein) advancing on Novgorod. The panzer corps was struck in the flank and rear, and 8th Panzer Division was encircled. Threatened with destruction, 8th Panzer Division broke out westwards (loosing or damaging around 70 tanks in the process) and the situation was stabilised by 18th July. This attack represented the first significant success by Soviet forces in this sector, and delayed any further advance by a week. By 28th July the 41st Panzer Corps had secured a bridgehead over the Luga River at Kingisepp, and by 31st July 16th Army had advanced to the southern shore of Lake Ilmen. By 5th August Army Group North had established a continuous line just north of Kingisepp, just east of Staraya Russa and Kholm, and linked up with Army Group Centre’s 9th Army which had (temporarily) captured Velikiye Luki. Despite desperate fighting however, large pockets of Red Army soldiers were not captured by Army Group North as they were in the more critical sectors further south. On 22nd June 1941 the German and Soviet forces were deployed in the central sector on the border as shown in the map below. Note, the Soviet’s Western Special Military District also had the 13th Army HQ deployed in the Minsk area, supported by the 17th and 20th Mechanised Corps. In the central sector, north of the Pripet Marshes (the most vital sector as far as the German plan was concerned), things went really wrong for the Soviets. This was primarily because it was where the main effort of the German offensive occurred, and it was against the second strongest (not the strongest) Military District in the USSR. Pavlov’s Western Special Military District (Western Front from 22nd June) faced two German Panzer Groups as opposed to only one in the other sectors. These were the 3rd Panzer Group (Hoth) with two panzer corps and four panzer divisions, and 2nd Panzer Group (Guderian) with three panzer corps and five panzer divisions. In terms of overall equipment and support units, 2nd Panzer Group was the most powerful panzer group in the Wehrmacht in June 1941. The 3rd Panzer Group launched its offensive north of the Bialystok salient and had already reached the Nieman River by midday on the 23rd June. Despite several localised counter-attacks, by 24th June leading elements of 57th Panzer Corps (Kuntzen) had reached Vilnius while 39th Panzer Corps (Schmidt) advanced rapidly towards Minsk. 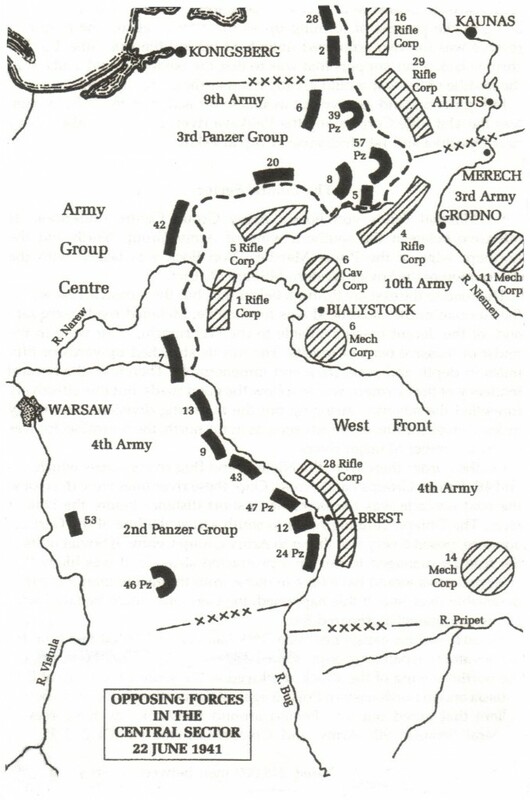 Meanwhile 9th Army (Strauss) followed in support and placed immense pressure on the Soviet 3rd and 10th Armies around Bialystok, Grodno and then Lida. By 26th June 39th Panzer Corps was only 18 miles north of Minsk while other elements of the corps headed for Borisov in order to jump the Beresina River. Meanwhile the 57th Panzer Corps headed towards Polotsk on the upper Dvina River. 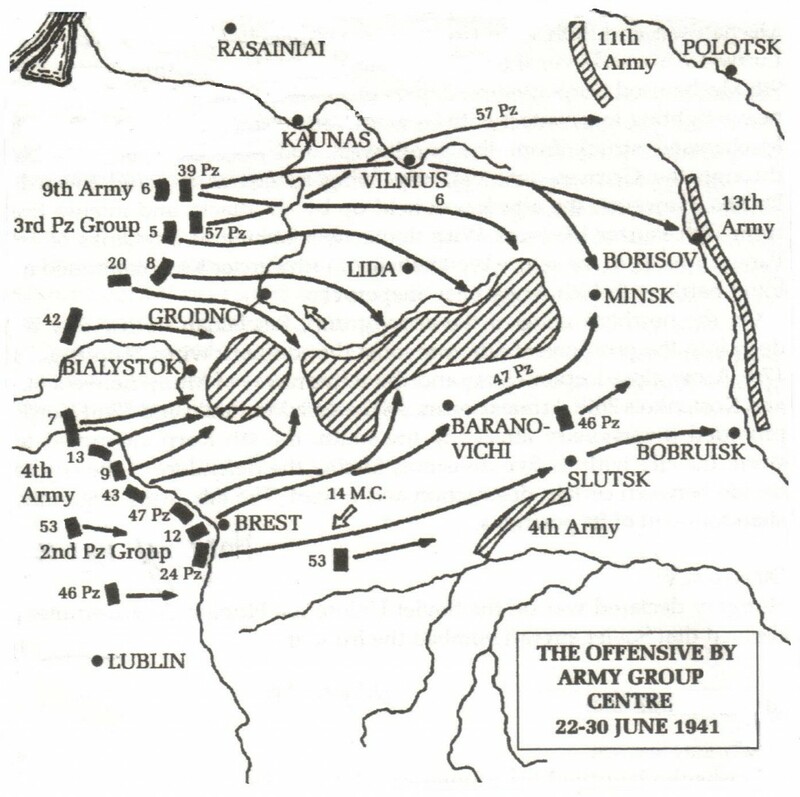 The 2nd Panzer Group punched a hole through the 4th Army defences on the Bug River, bypassed the fortress of Brest-Litovsk (which held until 29th June), made short work of the 14th Mechanised Corps (4th Army’s armoured reserve which was destroyed as an offensive force in two days) and rapidly proceeded north-eastwards. The 24th Panzer Corps crossed the Bug south of Brest and headed straight for Slutsk and Bobruisk on the Beresina River. Slutsk fell on 26th June and Bobruisk was reached on 28th-29th June. By 30th June the 24th Panzer Corps had secured a crossing of the Beresina River and despite repeated counter-attacks on the bridgehead (and attempts by the VVS to bomb the bridges) the 24th Panzer Corps was soon across. The 47th Panzer Corps crossed the Bug north of Brest, proceeded through Slonim (captured after a fierce fight) and headed towards Baronovichi which was captured on 25th June. The corps then wheeled north-east towards Minsk where it linked up with 3rd Panzer Group’s 39th Panzer Corps on 27th June. The resultant Bialystok-Minsk pocket contained the Soviet 3rd and 10th Armies, and most of 4th and 13th Armies: almost the entire Western Front and its reserves that existed on 22nd June 1941. Close behind the 2nd Panzer Group’s main thrusts followed 46th Panzer Corps (Vietinghoff) and 4th Army (Kluge). 4th Army attacked north and north-eastwards and on 28th June its infantry linked up with 9th Army west of Bialystok. Thus the Bialystok-Minsk pocket was actually sliced into two major pockets; one centred around Bialystok and the other a much larger pocket east of Minsk. It took until 8th July for these pocket to be liquidated by the German 4th and 9th Armies, yielding approximately 288 000 POWs. Western Front’s commander, Army General D.G. Pavlov (who was summarily executed for treason) was used, along with several other senior officers, as a scapegoat for Western Front’s rapid collapse. Unfortunately much post-war literature has continued with the idea that Western Front’s command failed in some exceptional way. In fact an in depth analysis of the state of the respective forces involved (especially the Soviet unit’s totally inadequate transport), the German Army’s operational technique and tactical combat proficiency, the speed with which the panzer corps’ could advance, and the unfavourable initial deployment of Soviet forces (which was largely due to the Stavka’s direct involvement), shows that Western Front never really had a chance. Even if Pavlov had immediately known the seriousness of the situation and issued appropriate orders (with his already crippled command and communication systems) it would have been very difficult to save the bulk of Western Front. Pavlov may not have been a brilliant commander but he was no worse than most of his generation. He was largely a victim of being in the wrong place at the wrong time; along with most of the other 671 000 Red Army soldiers in the Western Special Military District on 22nd June 1941. Realizing that the first Western Front was shortly going to cease to exist, the Stavka committed virtually its entire strategic reserve (that existed on 22nd June 1941) to the Minsk-Smolensk-Moscow axis under the new and aptly named Reserve Front (formed on 11th July). The 16th Army (from Transbaikal) and 19th Army (from North Caucasus) immediately moved from the south of Kiev and were deployed south and north of Smolensk respectively. The 20th Army (from the Orel region) moved from the Moscow area and was deployed on the Dvina-Dnepr land bridge between Orsha and Vitebsk. The 21st Army (from the Volga region) was deployed on the Dnepr near Rogachev. The 22nd Army (from the Urals) was deployed on the Dvina River bend north of Vitebsk. The 24th Army moved from Siberia and was deployed west of Smolensk. In addition the newly mobilised 28th Army (the HQ formed after 22nd June) was deployed north of Briansk. The Stavka obviously realised (even if Hitler didn’t) that loosing the Moscow region would potentially result in loosing the war, and wholly expected the Wehrmacht to pursue this objective before the autumn of 1941. 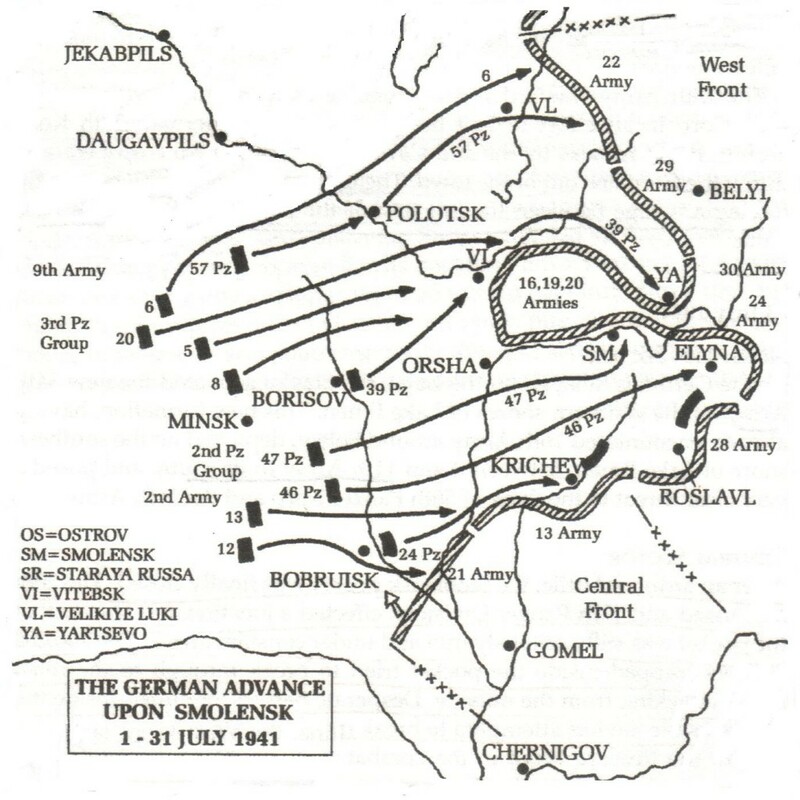 Consequently they realised that the ‘Battle of Smolensk’ was critical and assumed its outcome would determine if an offensive against Moscow could continue. While the Bialystok-Minsk pocket was being eliminated, the 2nd and 3rd Panzer Groups pressed on. On the northern wing 3rd Panzer Group’s 57th Panzer Corps (with only the 19th Panzer Division as the 12th had transferred to 39th Panzer Corps) reached the Disna and by 3rd July was fighting with 22nd Army to force a crossing. This battle would continue until 8th July by which time 57th Panzer Corps managed to cross the Dvina north of Polotsk. On 2nd July the 39th Panzer Corps (now with three panzer divisions) established another bridgehead over the Beresina River at Borisov and by 5th July the corps was heading north-eastwards towards Vitebsk. Meanwhile 47th Panzer Corps approached the Beresina at Brodets, had stormed across by 4th July and was heading for the Dnepr south of Orsha. The 46th Panzer Corps quickly moved up to create a link between the 47th Panzer Corps and the 24th Panzer Corps, which was already across the Beresina and had reached the Dnepr River on 5th July. In addition, the OKH had released its reserve, the 2nd Army, which was advancing behind the 2nd Panzer Group. Army Group Centre was racing forward as fast as possible to ‘jump’ the Dnepr, seize the Dvina land bridge, and pre-empt any attempt by the Soviets to establish a strong defence line along the Dnepr River and around Smolensk. In the intervening period Timoshenko had become the commander of the ‘Western Strategic Direction’ which enabled him to take control of the new Western Front, appointing Eremenko (Pavlov’s immediate replacement) as his deputy, and incorporating most of the Reserve Front (under Budennyi) into Western Front. Timoshenko had planned a series of major counter-attacks with the strategic reserves. The two most important were the 20th Army attacking against the panzer corps in the Lepel area with the 5th and 7th Mechanised Corps, and 4th, 13th and 21st Army attacking against the south flank of 2nd Panzer Group. The 5th and 7th Mechanised Corps (six divisions), which were by far the two strongest corps in Stavka reserves, were the main units in the Lepel Offensive Operation (also referred to as the Orsha Counter-Offensive) from 6th to 11th July 1941. On 22nd June these two corps had 2 094 tanks, which represented 80% of the tanks in the Reserves of the STAVKA GK on that date. The offensive was conducted by the reinforced 20th Army in Western Front in conjunction with the 44th and 69th Rifle Corps (with seven rifle divisions), elements of the 2nd and 4th Rifle Corps, and the 4th Airborne Corps. This major counter-offensive was in line with the Stavka pre-war plan to use its mechanised corps to halt, repel and destroy any invading forces. As such the Lepel Offensive Operation was a serious attempt to stop and then defeat the 3rd Panzer Group while it was still west of the Dvina-Dnepr River line. The 5th and 7th Mechanised Corps attacked with over 2 000 tanks on 6th July. It developed as a meeting engagement with the 3rd Panzer Group’s 39th Panzer Corps and the 2nd Panzer Group’s 47th Panzer Corps. In five days of fighting the 7th, 12th, 17th and 18th Panzer Divisions defeated and decimated the 5th and 7th Mechanised Corps and supporting rifle forces, and continued their advance on Vitebsk and Orsha. The 5th and 7th Mechanised Corps lost 832 tanks, many personnel and much heavy equipment in the battle, withdrawing in disorder eastwards across the Dnepr river. The defeat forced Timoshenko to commit 19th Army to defend Vitebsk. It was still disembarking and attempting to fully deploy when it was hit by the rapidly advancing 39th Panzer Corps. After a furious battle 39th Panzer Corps seized Vitebsk, and by 13th July it had broken through and was heading eastwards to form the northern enveloping arm around Smolensk. Further north the 57th Panzer Corps had secured its crossings on the Dvina and by 13th July was heading towards Velikiye-Luki. By this time strong elements of 9th Army had moved up behind the two panzer corps, taking Polotsk and consolidating 3rd Panzer Group’s advance line. On the southern wing, 24th Panzer Corps had crossed the Dnepr south of Mogilev, defeated elements of the battered 13th Army defending the river, and by 13th July was advancing towards Roslavl. Similarly, the 47th and 46th Panzer Corps had crossed the Dnepr between Orsha and Mogilev. The 47th Panzer Corps immediately advanced along the Dnepr river line towards Smolensk, thus forming the southern enveloping arm around Smolensk, and on 13th July its 29th Motorised Division was only eleven miles from Smolensk. The 46th Panzer Corps meanwhile headed for the area El’nia-Roslavl. Moving up behind 2nd Panzer Group were elements of 2nd Army which had reached Rogachev and Zhlobin by 13th July. On 13th July Timoshenko’s next major counter-attack began. It involved the reinforced 4th and 13th Armies (both ‘original’ armies having been virtually destroyed around Minsk), and the fresh 21st Army. This offensive, known as the Bobruisk Offensive Operation,(4) involved striking the south flank of the German advance (the 24th Panzer Corps) and the German 2nd Army in Rogachev and Zhlobin. The main strike forces consisted of: 21st Army’s 25th Mechanised Corps (from Stavka reserve with 250 tanks) and 67th Rifle Corps (in conjunction with the 4th Army) attacking into 24th Panzer Corps south flank, 13th Army elements (mostly retreating from Dnepr River line) attacking 24th Panzer Corps from the north-west, and 21st Army’s 63rd Rifle Corps attacking the German 2nd Army in Rogachev and Zhlobin. The attacks went in as planned at heavy cost, but only the 63rd Rifle Corps’ attack had any significant success: it succeeded in pushing the Germans out of Rogachev and Zhlobin before the line was stabilised. The more significant result of this melee was that 24th Panzer Corps kept its southern flank intact and broke out eastwards and north-eastwards to link up with 46th Panzer Corps encircling Mogilev from the north. In so doing the 13th Army’s 61st and 45th Rifle Corps, and remnants of the 20th Mechanised Corps, became isolated in and around Mogilev. Group Maslennikov, formed from 29th Army. It contained the 243rd, 252nd and 256th Rifle Divisions. It was ordered to attack south from Toropets to bring pressure to bear on the outer German perimeter. Group Khomenko, formed from 30th Army. It contained the 242nd, 250th and 251st Rifle Divisions. It was ordered to attack the perimeter south-west from Belyi. It also had support from 50th and 53rd Cavalry Divisions stationed just west of Belyi. Group Kalinin, formed from 24th Army. It contained the 53rd Rifle Corps with the 89th, 91st and 166th Rifle Divisions. It was ordered to attack westwards, and hit the perimeter just north of Yartsevo. Group Rokossovsky. It initially contained the 38th Rifle Division, 101st Tank Division and 107th Mechanised Division. It was ordered to attack westwards towards Yartsevo in order to pin down the 7th Panzer Division their and help keep the neck of the salient open. It was reinforced after 22nd July. Group Kachalov, formed from 28th Army. It contained the 145th, 149th and 222nd Rifle Divisions, and 109th Tank Division. It was ordered to attack from Roslavl in a north-west direction towards Smolensk. On face value the above ‘operational groups’ appear as a significantly powerful offensive force. However, it is apparent that the Western Front was now scraping the bottom of the barrel to find mobile offensive units. The first thing that is apparent is that all the armies involved, except the 24th, were brand new. The 28th Army was mobilised in late June, and the 29th and 30th were only mobilised in July. They and just been assigned to Reserve Front when the situation demanded they move forward to support Western Front. In addition, of the 18 divisions involved (above), only 7 rifle divisions were per-war divisions: every other division had been mobilised from scratch in June or even July, many in a period of only two weeks. Consequently, even though they mostly used ‘trained’ reservists, the new units were barely formed, had never trained as a unit, and their equipment left a lot to be desired. Unsurprisingly when the various ‘operational groups’ carried out their orders from 21st July onwards, all the attacks except that by Group Kachalov (see below), were soon repulsed with heavy casualties. The Kachalov operational group (28th Army) attacked towards Smolensk from Roslavl on 23rd July. It hit the weakest point in the German perimeter: a gap between 24th Panzer Corps’ 3rd Panzer Division near Mstislayl and 46th Panzer Corps’ 10th Panzer Division in El’nia. The defenders were thin on the ground and were principally from the Gross-Deutschland Motorised Infantry Regiment from 46th Panzer Corps. Group Kachalov initially made good progress and attempted to encircle the defenders, who soon received support from forward elements of 18th Panzer Division. By 24th-25th July the German 292nd and 263rd Infantry Divisions from 4th Army’s 9th Infantry Corps arrived and stabilised the front. Meanwhile 24th Panzer Corps had not been idle. 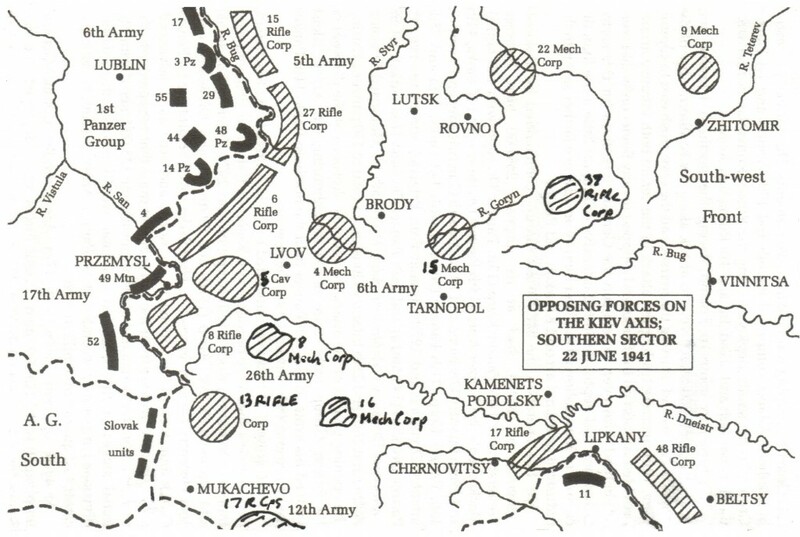 By 30th July most of the corps had regrouped between Krichev and Mstislayl on the Sozh River. On 31st July the corps broke out of its bridgehead on the Sozh River and by 1st August it hit the east flank of group Kachalov and 28th Army. By 3rd August it had encircled Roslavl from the south and linked up with 4th Army’s 9th Infantry Corps advancing south. The resulting Roslavl Pocket (eliminated by 6th August) yielded around 39 000 POWs; this was most of Group Kachalov as well as 28th Army’s offensive forces. 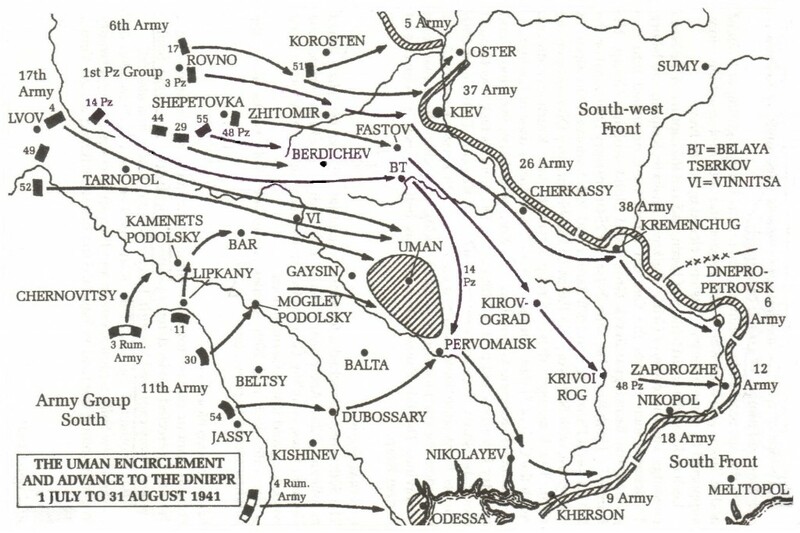 The shattered 28th Army quickly withdrew behind the Desna River. In the meantime the German 4th Army had eliminated the forces still in Mogilev (later designated a hero city by the Soviets for its tenacious defence, unlike Smolensk) and captured another 35 000 POWs. Further north, relieved by infantry divisions, the 20th Motorised Division (39th Panzer Corps) and 17th Panzer Division (47th Panzer Corps) had all but closed the Smolensk pocket by 27th July. By this time six German Infantry Divisions from 9th Army’s 20th, 5th and 8th Infantry Corps were pounding the pocket from the north, west, and south-west respectively, inflicting huge casualties in the pocket. Bitter fighting continued in and around the pocket’s very narrow neck, and a substantial number of Red Army soldiers escaped through the gap without much heavy equipment. However, when the Smolensk pocket was finally eliminated on 5th August the Soviet 16th, 19th and 20th armies within had ceased to exist, and another 309 000 POWs had been taken. By any assessment, the second Western Front that had been formed from the Stavka’s strategic reserves on 22nd June 1941 had been virtually eliminated by 5th August. By early August the stage was set for an offensive by Army Group Centre to invade the Moscow-Gorki space in August-September 1941. However events and decisions made elsewhere were to preclude this happening. With the battle of Smolensk barely underway, Hitler issued Directive No 33 on 19th July 1941. It stated that Moscow was no longer the primary objective and that once the Smolensk pocket had been reduced Army Group Centre would hand over its panzer groups to its neighbours, Army Group North and Army Group South. 3rd Panzer Group’s 57th Panzer Corps (Kuntzen) was to move north to Leningrad and assist 18th Army, while 39th Panzer Corps (Schmidt) was to attack northeast from the Volkhov River and assist Army Group North to isolate Leningrad. Meanwhile 2nd Panzer Group was to drive south and link up with the 1st Panzer Group (Army Group South) which was to cross the South Dnepr River between Cherkassy and Kremenchug. The latter manoeuvre was aimed at trapping and destroying the troublesome Southwestern Front, and occupying the Ukraine. Over the ensuing few weeks there was much confusion and vacillating over the German’s priorities. This was because most of the senior German commanders, most notably Halder (OKH Chief of Staff), Jodl (OKW Chief of Staff), von Bock (Cmdr Army Group Centre), Hoth (Cmdr 3rd Panzer Group) and most famously Guderian (Cmdr 2nd Panzer Group), unsurprisingly stated that Directive No 33 was a very bad idea. Brauchitsch (ObdH) and Keital (OKW) added various supplements to Directive No 33, aimed at either stalling the implementation of the directive or calling for forces to be ‘reorganised’ for an offensive against Moscow as soon as practical. One of the most ardent proponents of an early Moscow offensive was Guderian. In fact his decision to encircle and seize Roslavl was largely in order to clear the right flank as a prelude to an advance eastwards on Moscow. He hoped that placing 2nd Panzer Group in such an advantageous position (and effectively disrupting the defences of 28th and 43rd Armies) would facilitate an opportunistic change in Directive No 33. As late as 17th August, Brauchitsch and Halder tried one last appeal to resume the advance in the centre. Their arguments were set forth in a memorandum detailing why the advantage gained by the Wehrmacht on the road to Moscow should not be squandered. Ultimately however Hitler’s will prevailed and if anything he became even more intransigent. He stated his generals knew “nothing about the economic aspects of war”, that Leningrad must be secured to “secure the iron ore route to Sweden”, that the fertile Ukraine region was needed “to provide raw materials and agricultural produce Germany would need for a long war”, and that occupation of the Crimea would “neutralise the threat from the Russian Air Force against the Ploesti oil fields”. Thus in Hilter’s eyes, Leningrad and the Ukraine both had precedence over Moscow, and the latter could be taken at leisure at a later date. Fortunately for the world at large, the Stavka did not suffer from such strategic incompetence and from September to the end of 1941 the Soviets threw the large majority of their available forces and resources into defending the approaches to Moscow. From a purely military perspective the operations of Army Group South (Rundstedt) arguably represent the most interesting battles on the East Front in June and July 1941. This is because Southwestern Front (Kirponos) came closest to implementing the Red Army’s pre-war plans in June 1941. Essentially this called for the 1st echelon defensive forces (rifle armies) to blunt and possibly stop the enemy offensive, the 2nd echelon forces (mechanised corps) to counter-attack and destroy the enemy spearheads, and the 2nd and 3rd echelon forces to exploit the victory and conduct a strategic offensive into the enemy’s rear area. As the south-western axis into the Ukraine was where the main effort of any German attack was expected, Kirponos had a huge force at his disposal. The Kiev Special Military District (Southwestern Front from 22nd June) initially possessed 58 (including 16 tank and 8 mechanised) divisions, 907 000 men, 5 465 tanks (including 496 T34s and 278 KV tanks) and 2 059 combat aircraft (excluding Stavka reserves already in the district). By comparison Army Group South (excluding 11th Army which attacked Southern Front from Rumania) had 34 (including 5 tank and 3 motorised) divisions, approximately 809 000 men, 923 fully tracked AFVs, and 652 combat aircraft (excluding 45 Ju 52 transports) at its disposal. Of these only 425 AFVs were Pz IIIs, Pz IVs and StuGs with 50-75mm guns. According to these figures and conventional military theory, it is Army Group South which should have been the defending force and any attack by them should have been easily stopped in its tracks. On 22nd June 1941 the German and Soviet forces were deployed in the southern sector on the border as shown in the map below. Note, the Soviet’s Kiev Special Military District also had the 19th and 24th Mechanised Corps (not depicted), and the 31st, 36th, 49th and 55th Rifle Corps, to the east in Front Reserves (not depicted). On 22nd June 1941 the German 6th Army (Reichenau) and 1st Panzer Group (Kleist) duly attacked along the Lutsk-Rovno axis with the objective of seizing Lutsk, Rovno, Dubno and Ostrog. Within 18 hours of the start of the German invasion elements of the 4th, 15th, 22nd and 9th Mechanised Corps started moving to either blocking positions or counterattack positions. In the next three days there followed a series of meeting engagements between the various mechanised corps closing in and the panzer corps trying to break out. Within 24 hours the Soviets had committed six full mechanised corps, an additional mechanised division, a full cavalry corps and two full rifle corps (the 36th and 37th) to counter-attack the German forces in what is known as the Lutsk-Rovno-Dubno-Lvov border battle. Nowhere is there more evidence that the Soviet pre-war plan was to hold the Western Miliary Districts with echeloned defences, and then repulse and destroy an invader in those districts. By 25th June the 3rd Panzer Corps’ (Manteuffel) 13th and 14th Panzer Divisions had secured Lutsk. However on 26th June the main Soviet counter-attack began with the aim of cutting off and destroying the 14th Panzer Corps’ (Wietersheim) 16th Panzer Division and 48th Panzer Corps’ (Kempf) 11th Panzer Divisions. 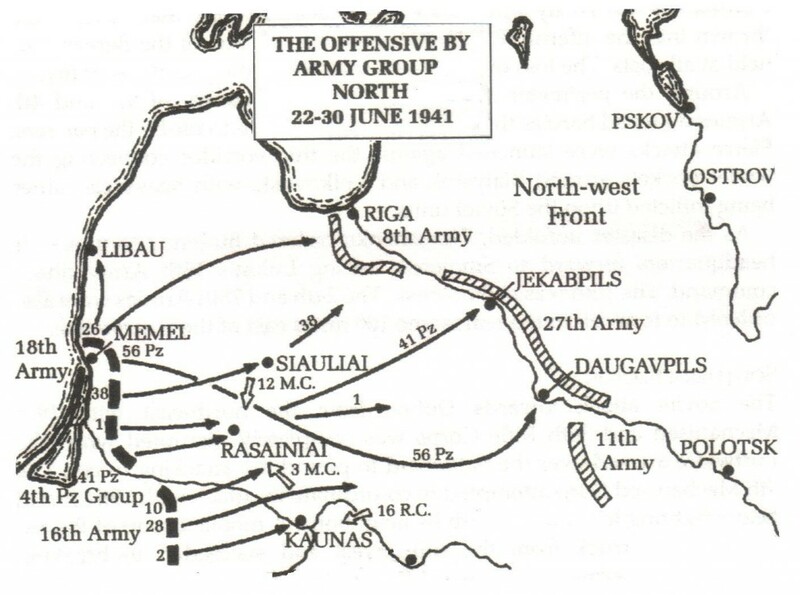 Of all the Soviet counter-attacks in late June 1941, this one came the closest to achieving the pre-war plan of isolating and destroying a large invading mobile force. The situation was saved by several German infantry divisions moving up and two panzer divisions counter-attacking the flanks of the various Soviet attack groups. 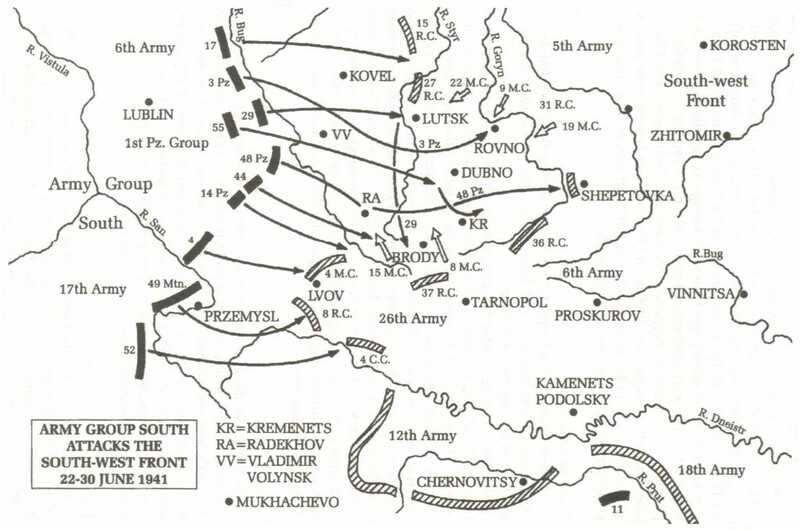 By 28-29th June the Soviet position began to deteriorate rapidly as they ran low on fuel and ammunition, and the whole left flank of the Soviet line had effectively collapsed by 1st July. It is estimated that at least 2 280 Soviet tanks were completely lost from 22nd June to 1st July 1941 in the Lutsk-Rovno-Dubno-Lvov border battle. This means the Southwestern Front irrecoverably lost at least 42% of its initial tank strength in the first 10 days of the war. Meanwhile to the south of this battle the German 17th Army (Stulpnagel) attacked eastwards with two infantry and one mountain corps, pushing back the Soviet 6th and 26th Armies, and had reached Lvov and the Dniester River (south of Lvov) by 30th June. In the meantime V Fliegerkorps / Luftflotte 4 struggled to attain air superiority in this sector which is unsurprising given they had a 3.2 to 1 inferiority in combat aircraft. The Luftwaffe losses in this sector were initially relatively heavy, but by early July 1941 Luftflotte 4 had achieved air superiority over the south-western axis of the front and was able to conduct serious interdiction operations against the Red Army’s Southwestern Front. Starting on 1st July the German-Rumanian forces on the Rumanian border started their offensive operations against Southern Front (although several minor exchanges had occurred prior to this date). The Axis forces included the German 11th Army (Schobert, with seven German and four Rumanian infantry divisions) organised into three infantry corps, and the Rumanian 3rd and 4th Armies (under Antonescu). 11th German Army faced a daunting task: its three infantry corps had immediately to fan out and attack independently, while crossing two major rivers, and against a dug in and alerted enemy. To make maters worse, 11th Army’s entire armoured support consisted of only one assault gun battalion (21 assault guns) and elements of the 1st Rumanian Armoured Division (one regiment with 126 R-2 light tanks). In the north, 11th Infantry Corps was to cross the Prut River near Lipkany and attack the junction between the Soviet 12th and 18th Armies, while the 3rd Rumanian Army attacked the 12th Army. In the centre, 30th Infantry Corps was to cross the Prut near Stefanesti and advance on Mogilev-Podolski against the Soviet 18th Army. In the south, 54th Infantry Corps was to cross the Prut just north of Jassy, strike at the junction between the 18th and 9th Army, and advance on Dubossary. In the far south the 4th Rumanian Army was to assault the Soviet 9th Army and advance on Odessa. The initial axis objective was to ‘recapture’ Bessarabia, obtain as many bridgeheads over the Dniester River as possible, and advance into Southern Front’s south flank and rear. Initially the going was slow because the German-Rumanian attacks were launched over the Prut River, without adequate armour support, and against a ready enemy in fortified positions. Despite this, by 4th July the Southern Front’s 18th and 9th Armies were being pushed back, with the 18th Army experiencing great difficulty retreating across the Dniester River as no permanent bridges were left. The 30th Infantry Corps rapidly established a bridgehead around Mogilev-Podolski (by 5th-6th July) which started creating a potential salient around the Soviet forces further north. In this salient were the Soviet 6th, 12th, 18th and 26th Armies. At around the same time the Rumanian 4th Army had fought its way across the lower Prut and was advancing on Odessa. Although the German-Rumanian forces performed extremely well, it has to be said that they possibly would not have achieved their goals if the Soviet 12th Army’s 16th Mechanised Corps and the 9th Army’s 18th Mechanised Corps had not already been ordered northwards by Southwestern Front in order to counter-attack the advance by 1st Panzer Group. These mechanised corps, along with the 2nd Mechanised Corps still in 9th Army, would possibly have been able to counter-attack and eliminate any German-Rumanian bridgeheads over the Dniester because the latter were operating with insignificant armour and barely adequate air support. However this may not have been the case: it is very significant that when 2nd Mechanised Corps (with 489 tanks including 60 T-34 and KVs) and 48th Rifle Corps attacked the 11th Army’s 54th Infantry Corps building a bridgehead over the Prut north of Jassy on 3rd-4th July, they were beaten back. This is especially significant because 54th Infantry Corps had only one Rumanian and two German infantry divisions, and no armour at all. Around 4th July Army Group South’s commander, Gerd non Rundstedt, foresightedly decided to split the efforts of 6th Army and 1st Panzer Group in two diverging directions once Zhitomir and Berdichev had fallen. It was generally against the principles of mobile armoured warfare to do this, but it must have been apparent to Rundstedt that Southwestern Front’s main deployment would be to stop a direct assault on Kiev. As Southwestern Front still had formidable armoured as well as infantry reserves, and Army Group South’s forces were already heavily committed, a direct assault on Kiev would be very difficult and costly. Accordingly he ordered 3rd Panzer Corps to assist 6th Army’s ‘northern group’ to advance on Kiev, while 14th and 48th Panzer Corps and 6th Army’s ‘southern group’ were to turn south from Berdichev towards Pervomaisk and Kirovograd. The aim of the latter group was to trap Soviet forces under pressure from the 17th and 11th Armies further south. In early July the German 6th Army’s 17th and 51st Infantry Corps advanced eastwards towards Korosten in the difficult terrain of the southern Pripet Marshes, while 3rd Panzer Corps and 29th Infantry Corps advanced eastwards towards Zhitomir. These forces were heading towards Kiev and drove a wedge between 5th and 6th Armies. Further south the 48th and 14th Panzer Corps reached the area around Berdichev on 7th-8th July and captured the city after a brief battle. At the same time the German 17th Army’s three corps continued to push the Soviet 6th and 26th Armies back towards Tarnopol and Proskurov. This caused the Soviet 12th Army to retreat rapidly eastwards to prevent 17th Army encircling it from the north. On the southern wing the Soviet 18th and 9th Armies continued to resist and counter-attack 11th Army at Mogilev-Podolski and around Kishinev, although by 8th July the 11th Army had firmly established its bridgeheads across the Dniester River. As the advancing German forces seized the Novgorod-Volynskii Fortified Zone along the Soviet 1939 borders, Southwestern Front’s (Kirponos) attention was focused on halting the German armour on the road to Kiev, and restoring the links between the battered 5th and 6th Armies. Accordingly the Stavka ordered a series of major counterstrokes aimed at forestalling the German advance on Kiev in what is known as the Novgorod-Volynskii Offensive Operation. For this operation Southwestern Front had the 9th, 19th and 22nd Mechanised Corps immediately available, while the 16th and 18th Mechanised Corps were ordered northwards from 12th Army and Southern Front’s 9th Army. Starting on 11th July, the 31st Rifle Corps and 9th, 19th and 22nd Mechanised Corps attacked south-westwards; hitting mainly the 17th and 29th Infantry Corps and 3rd Panzer Corps. A few days later the 6th Army joined the offensive by attacking north-westwards towards Berdichev with the 49th Rifle Corps and 16th Mechanised Corps (18th Mechanised arrived too late form the far south). After four days of bitter fighting, and despite the northern attack force advancing some 10 miles, the Soviets were forced to withdraw. The consequence was further huge Soviet tank losses: the 9th, 19th and 22nd Mechanised Corps were left with only 95 tanks between them. On 22nd June 1941, only 23 days previously, these three mechanised corps had 1 430 tanks between them! With Zhitomir and Berdichev firmly in German hands, the 14th and 48th Panzer Corps started to advance east and then south-east. (5) It is evident at this point that both the Stavka and Southwestern Front assumed Army Group South would exploit the failed counter-offensive and advance on Kiev with 1st Panzer Group. Accordingly they moved the newly mobilised 37th Army to cover the direct route into Kiev. They also pulled 26th Army back into front reserve and gave its HQ control of all forces east and north-east of Belaya-Tserkov with orders to link up with 5th Army further north. Lastly, the 3rd Airborne Corps was transferred from Southern Front and deployed at Borispol to counter the possibility of a German parachute assault across the Dnepr. (5) Some accounts state that at this point the 3rd Panzer Corps had an ‘open road’ to Kiev, but that Hitler forbade an opportunistic advance on Kiev. It seems unlikely the road to Kiev was ‘open’ given the Soviet forces in the area, and Kiev itself was heavily defended with close to an entire Soviet Army. It was certainly not a city that a panzer force could have seized with a coup de main. By 15th-16th July, 1st Panzer Group’s 48th Panzer Corps had achieved a decisive breakthrough near Kazatin where it had been battling the 6th Army’s 4th Mechanised Corps, and headed towards Kirovograd. Simultaneously, 14th Panzer Corps (slightly to the south) headed south towards Pervomaisk; thus forming the inner encircling arm threatening 6th, 12th and 18th Armies. Meanwhile the German 17th Army broke through the Stalin line near Bar, and by 18th July had crossed the Bug and formed a bridgehead around Vinnitsa. The 11th Army’s 30th Corps also advanced east from Mogilev-Podolsky. On the extreme south wing the 4th Rumanian Army broke out of its beachhead on the Prut River and, with the German 54th Infantry Corps, captured Kishinev. The 54th was ordered to cross the Dniester at Dubossary (to threaten the rear of Southern Front) while 4th Rumanian Army headed for Odessa. By now the Stavka and Southwestern Front realised the danger was not to the Kiev forces, but to Southwestern Front’s south flank. They ordered a limited withdrawal of the 6th, 12th and 18th Armies, and ordered the 9th Army’s 2nd Mechanised Corps to move north and block the 1st Panzer Group’s advance south. This was the second and last mechanised corps that Southern Front had available to send north to assist Southwestern Front. However, these measures proved to be too little and too late. By 20th July 48th Panzer Corps had broken through and captured Monastyriche; effectively severing the escape route of the 6th and 12th Armies. The 2nd Mechanised Corps was all that stood between 48th Panzer Corps and German forces further south. Southwestern Front immediately ordered 26th Army to attack south-westwards and assist the 6th and 12th Armies to escape, while the latter were ordered to breakout eastwards and link up with 26th Army. The 26th Army launched a ferocious attack from the Cherkassy area into the exposed flank of the 1st Panzer Group, but Rundstedt had already marched the 17th Army’s 4th Infantry Corps eastwards and then south to support the panzer’s thrust south. Over five days the fighting continued with 26th Army suffering massive casualties as its infantry repeatedly attacked 4th Infantry Corps without armour or air support. Meanwhile, only the Germans made significant advances as 14th and 48th Panzer Corps pressed south towards Pervomaisk to link up with the German 17th and 11th Armies. Further south the 11th Army’s 30th infantry Corps had reached Balta by 25th July which threatened to drive a wedge between 18th and 9th Armies of Southern Front (and push 18th Army into the forming Uman pocket). 18th Army’s 48th Rifle Corps counter-attacked in conjunction with 9th Army’s 2nd Cavalry Corps on 28th July but 30th infantry Corps held its ground, and by 1st August 30th Infantry Corps continued to advance eastwards. 11th German Army continued piling on the pressure however with 54th Infantry Corps also attempting to breakout of its bridgehead over the Dniester at Dubossary (to the south-west of Balta). On 2nd August the 48th Panzer Corps’11th Panzer Division linked up with 17th Army’s 101st Light Division (52nd Infantry Corps) south-east of Uman. At around the same time the 14th Panzer Corps’ 16th Panzer Division linked up with German and Hungarian troops at Pervomaisk. The 6th and 12th Armies, and a large part of 18th Army were sealed in a pocket between Uman and Pervomaisk. Under continuous attack from 17th and 11th Army, the Uman pocket didn’t last long and was liquidated by 8th August. Despite the best efforts of the Soviet 26th Army to break open the pocket, barely 11 000 men escaped. By 8th August the Uman pocket was destroyed with 103 000 POWs taken. The Uman pocket was a major defeat for Southwestern and Southern Fronts because there were at least 24 divisions lost, even though the prisoner yield was relatively low compared to the pockets captured by Army Group Centre. The fact that the average Soviet division in the pocket was down to around 4 000 men is illustrative of the intensity of fighting and the fact that the forces in the pocket fought desperately to breakout before surrendering. It is estimated that another 90-100 000 Red Army soldiers actually perished in the Uman pocket. In addition to loss of troops, the whole south flank of Southwestern Front and the northern flank of Southern Front were now shattered, making any defence of the territory west of the Dnepr untenable. By early August the newly mobilised Soviet 37th and 38th Armies had taken up positions on the Dnepr River at Kiev and Kremenchug. (A new 6th and 12th Army would shortly be assembled at Kharkov and Dnepropetrovsk with newly mobilised divisions). On 25th July, Rundstedt ordered 3rd Panzer Corps to leave its defensive positions on the Irpen River opposite Kiev and move south-eastwards along the Dnepr River line towards Cherkassy and Kremenchug. Evidently Rundstedt was already planning to regroup 1st Panzer Group in preparation for a breakout across the Dnepr River between Cherkassy and Kremenchug. This left only 6th Army’s 29th Infantry Corps to face 37th Army (around Kiev), and 51st and 17th Infantry Corps to face the 5th Army. This meant a direct assault on Kiev was now very difficult: with only three corps available to face the Soviet 5th and 37th Armies dug in across a major river. Perhaps sensing that the German forces would be focused on Uman, Kirponos ordered 5th Army to launch a surprise attack against 51st and 17th Infantry Corps. The attack force was comprised of the 5th Army’s 15th and 31st Rifle Corps, the remnants of the 9th and 22nd Mechanised Corps, and 1st Airborne Corps. The attack went in near Malin on 1st August and continued for five days. Although the Soviets managed a five mile advance the German line remained unbroken. Meanwhile the 29th Infantry Corps had attacked and by 5th August it had surprisingly managed to push 37th Army as far back as the outer suburbs of Kiev. On the south wing, the Southern Front’s 9th Army and badly damaged 18th Army were ordered to fall back to the Bug as soon as it became obvious that the Uman pocket was irrecoverable. This was because they were now totally exposed to a continued German advance south and subsequent isolation. With great difficulty, Southern Front started to withdraw the bulk of 9th Army towards Nikolayev and 18th Army eastwards across the Bug towards Nikopol. These withdrawal orders were timely because 14th Panzer Corps was already moving south along the east side of the Bug River, and on 6th August elements of the panzer corps pushed back the flank guard (2nd Cavalry Corps) and captured Voznesensk. Meanwhile, the Rumanian 4th Army had closed in on Odessa by 5th August and started encircling the fortified port. As the Black Sea Fleet was far stronger than any Axis naval presence in the Black See, the Odessa garrison was well supplied and even reinforced (to 86 000). The Red Army and Navy personnel defending Odessa had already been ordered to fight to the last man. In many respects the achievements of Army Group South from 22nd June to 5th August actually exceeded the more ‘spectacular’ achievements of Army Group Centre. Unlike Army Group Centre, at the beginning of the campaign Army Group South was facing an enemy superior in manpower, and vastly superior in terms of combat aircraft and tanks. In June 1941 the Southwestern Front had such a concentration of forces that it has led historians (and other commentators) to conclude that Stalin was preparing a pre-emptive strike from the Ukraine into Southern Poland and Rumania in 1941. This will not be discussed here; suffice to say that a detailed examination of Southwestern Front’s forces, their state of readiness, and their deployment, does not support the pre-emptive strike in 1941 hypothesis. What Stalin was planning in 1942 is more difficult to assess. Despite the odds against Army Group South, in a period of 45 days they had absolutely decimated Southwestern and to a lesser degree Southern Front. Over 24 divisions had been completely destroyed out of 80 divisions originally in the Kiev Special and Odessa Military Districts. Even worse, the average strength of the surviving pre-war rifle divisions was around half of the authorised levels, despite very large numbers of mobilised replacement riflemen arriving at the front. In terms of heavy weapons and particularly transport, all the surviving divisions were well below half strength. The greatest losses were amongst the tank forces and VVS. Out of the original 5 465 tanks and 2 059 combat aircraft available on 22nd June, only a few hundred of each remained. In early August 1941 Southwestern Front still had around 750 000 personnel on strength, (compared to 907 000 on 22nd June) but this was due to replacements and newly mobilised armies being mobilised and deployed east of the Dnepr. Perhaps Army Group South’s greatest achievement is that it forced the Stavka to mobilise and deploy no less than six new armies south of Kursk and west of Belgorod in July and August. These were the 37th, 38th, 40th, 2nd/6th, 2nd/12th and 51st Separate (in the Crimea) Armies. All these armies were therefore drawn away from the cental Smolensk-Moscow axis (where nine new armies were mobilised and deployed in July and August).